Arsene Wenger had a personal bodyguard for all games in the last two years of his Arsenal reign, according to a new book. An updated edition of The Inside Story Of Arsenal Under Wenger, by journalist John Cross, made the revelation. Arsenal confirmed their former boss had his own security detail when in public areas from summer 2016 until he left the club in May. The extra measures were taken after the threat of global terrorism were raise in fear for the safety of public figures around the world. 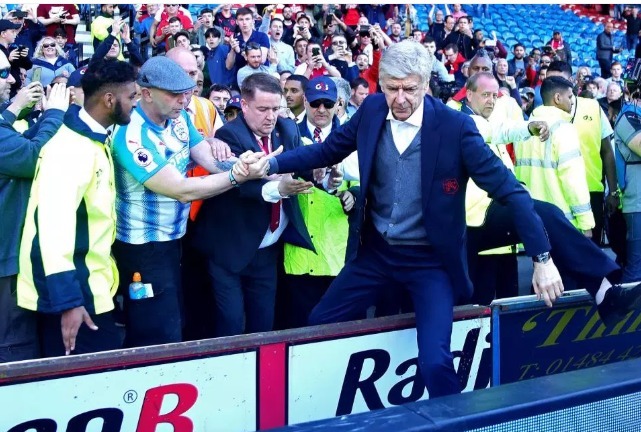 Wenger was a God-like figure during his early Arsenal tenure but the tide turned against the Frenchman, in some loud sections of the support, towards the end. At trip to Stoke in December 2014 ended in a 3-2 and shameful scenes as Gunners fans abused the 68-year-old as the team tried to board a train back to London. Ever loyal Wenger defended the dissenters and said they were acting out of love for the club. He added: “We travel in what we think is the best and the shortest way. “You want as well not to be isolated too much because you want contact with people who love the club, you want contact with the fans. “I took it as people who were upset because we lost a game and didn’t take it personally. “It was my function and the fact that I’m responsible for the club that was attacked. “I was sad and upset more by the result than by the individual reactions of people, which I can understand. When you love a club, you want the results to be positive. 0 Response to "Revealed! Arsene Wenger Had Bodyguard By His Side During His Last Two Years At Arsenal"